It is a tradition that began in 1974. It is a tradition in which one day is devoted to a creature we do not usually give much thought (for the human is usually centre). It is the one and only Corpus Christi Tortoise Fair. Graham, equipped with the official binder and love for all things tortoise-related, enthusiastically shares her plans for this year’s tortoise fair. A few basic details: it will be held from noon to five on May 28th, which is a Sunday (one hopes the weather is nice), in Corpus Christi College. Entrance is £2 for everyone, and all proceeds will go to charity. For some history, we open the first item in the binder: “Tortoise Fair Report 2016 with A Guide for the Modern Custos Testudinum.” It was written and typed up by James Bruce, last year’s tortoise keeper. In the report’s dozen or so pages, Bruce details the fair’s many activities and budget, explains his decision not to use LaTeX—a typesetting system usually used for maths and science papers—for the Tortoise Report (as an assiduous former tortoise keeper did), and thanks his Tortoise Keeper Assistant, Robbie Oliver. One can feel the love of tortoises that propelled such an intricate report! What great joy in meeting fellow tortoise lovers! It warmed me to hear that Foxe is “very well looked after.” Foxe lives in the President’s lodgings, and there is a scout who works in the garden and makes sure Foxe’s sleeping place is prepared and another scout who brings Foxe’s food. Very well looked after indeed. 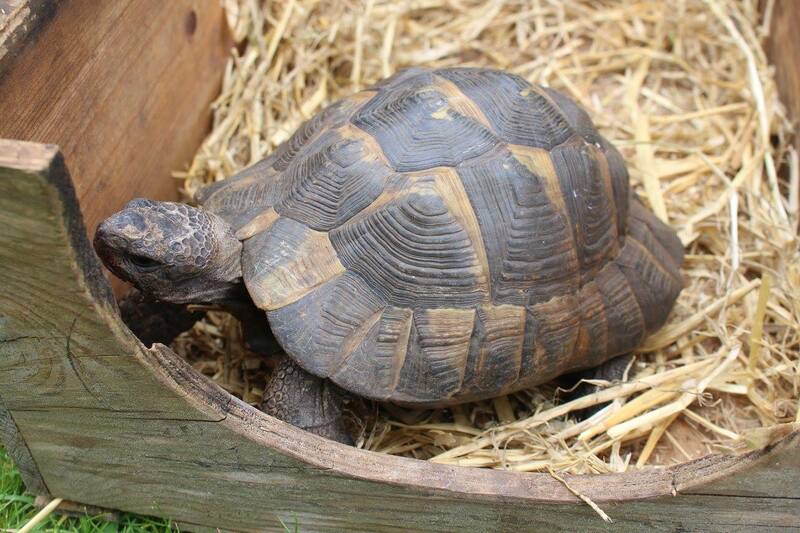 Do come to this year’s Tortoise Fair and meet Foxe and the other tortoises. There’s plenty of time to see the tortoises before the race, which starts at 3pm. There’ll be lots of music in the grounds, with performers including Corpus Choir musicians, Society of Oxford Ukelele Players, and Worcester Swing Band. There is also a tortoise-themed baking competition (the photos from last year were adorable!) Anyone can enter—just bring your baked goods on the day. If you are the competitive sort, but not the baking-competitive-sort, there will also be a human tortoise race (held at the same time as the tortoise race), in which a human tortoise must eat an entire lettuce before racing to the edge of the lettuce circle. Of course, plenty of food and drink will be available, from BBQ, to Pimm’s, to the classic Corpus Christi drink: “The Tortoise.” Graham has confirmed a variety of stalls. You can get your fortune told at Tarot Card Readers, run by Mystic Pete & Mysterious Krasnopolski, go duck fishing, have your face painted, spot as many pelicans as you can (that is, the pelican emblems in the main quad), enter the raffle, eat very healthy food at the Fairtrade stall, and take endless photos at the photo booth. What a time to be had! And there are so many tortoises to see (some are indeed rare appearances). A few recently made appearances at Emmanuelle’s Birthday Party—for the uninitiated, Emmanuelle is Regent’s Park tortoise and by some accounts celebrated her 114th birthday this past Saturday at her college. On your mark, get set, go!—I so look forward to seeing you there to watch the race unfold!